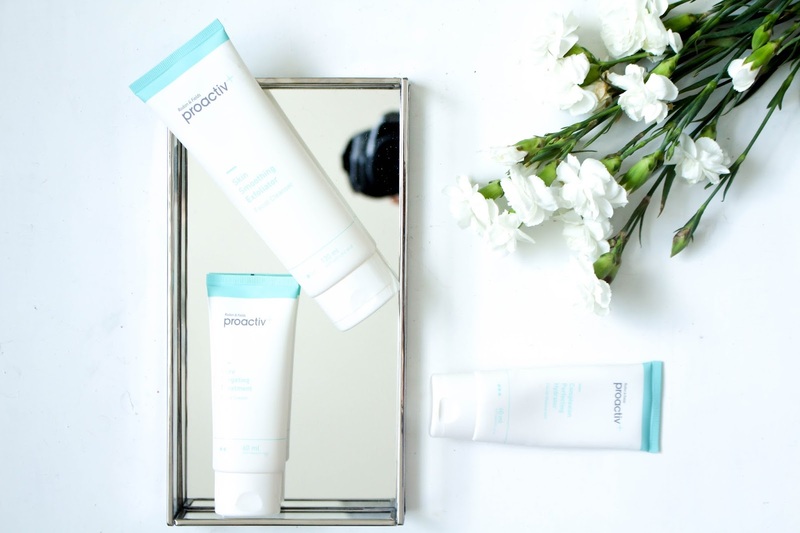 So a couple months back I decided to try out the Proactiv products. Since around February my skin has just gone from slightly spotty to I can’t leave the house. If you don’t know what Proactive is or haven’t seen the TV adds for it, it basically is a treatment for bad skin, I’m pretty sure Katy Perry was on the advert, yep that one. I honestly kind of thought it was a gimmick but my skin is so bad I was willing to try everything! Now before I go any further please note this post will be TMI so if you are not interested in reading about my oily skin then please opt out now… Right so basically my skin went from bad to worse over night, having excessive oily skin, acne patches around my chin/jaw and then a shower of normal spots all over oh and don’t let me forget clogged pores. It’s really horrible and I don’t know why this has happened but reading online I have found that if you suffered from acne when you were younger (which I did 13-16) you are probably going to get it again in your older teens/ early adult years. So all I can do is really put my acne down to that. I eat well (I try lol) and have been drinking a lot more water recently so I know I am doing everything I can possible to help my skin but I needed something else and that’s why I turned to proactive. So my mum actually mentioned the product to me and very kindly picked it up for me from Boots and the products she chose was the ‘Proactive + 3-Step Clear Skin System’. This is basically a three step skin care routine. The kit is £49.99 and it is a 60 day system. Which is expensive but if it works well it’s completely worth it! 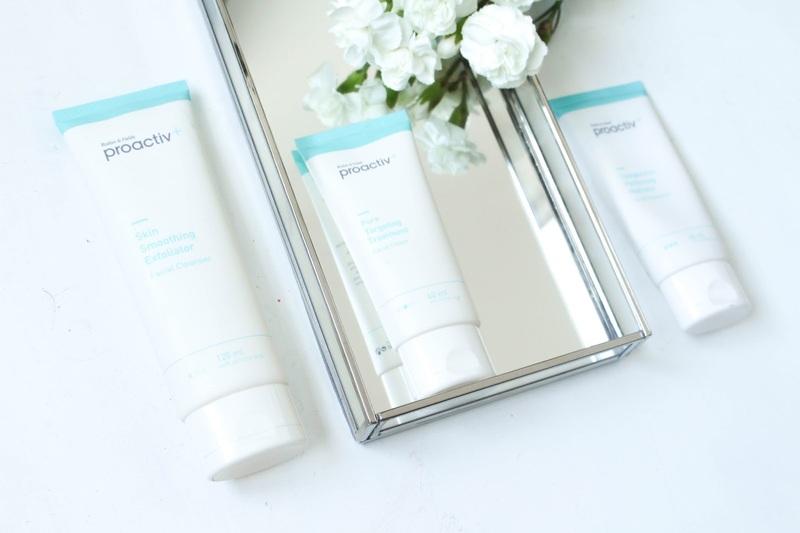 The 3 piece set contains and exfoliating face wash, a pore targeting cream and a hydrating moisturiser. You basically only use these 3 product twice a day every day for two months which honestly is a lot! I use a lot of skin care but I have a mixed up skin care, products I use everyday, weekly and then fortnightly. It is honestly really hard to stick to these three products as when I sleep I like to use a oil or a thick moisturiser, I also like to use a toner which I decided to consciously stop while trying out these products. You’ve honestly gotta give this treatment your all and really stick to it daily! 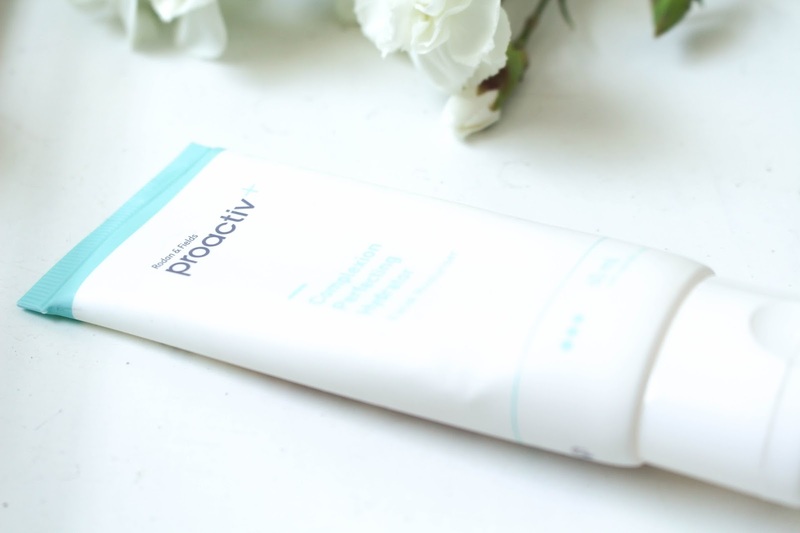 Now the good sides of the products are that the ‘Skin Smoothing Exfoliator’ (step 1) isn’t too harsh, it is something that I can use everyday without feeling like my skin is raw from the scrub. It has also been helping to try create more of an even skin base for applying makeup also! 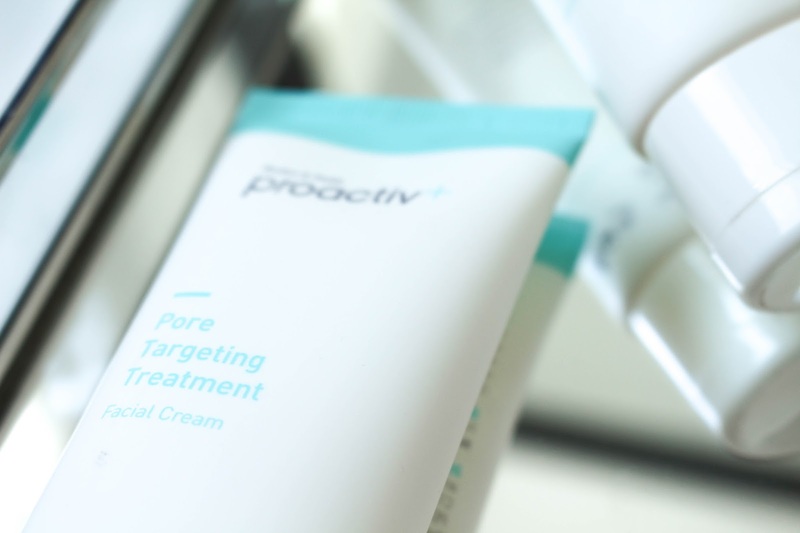 The ‘Pore Targeting Treatment’ (step 2) is really bloody good for redness and it kind of makes my skin look a bit fresh and glowy after the use! 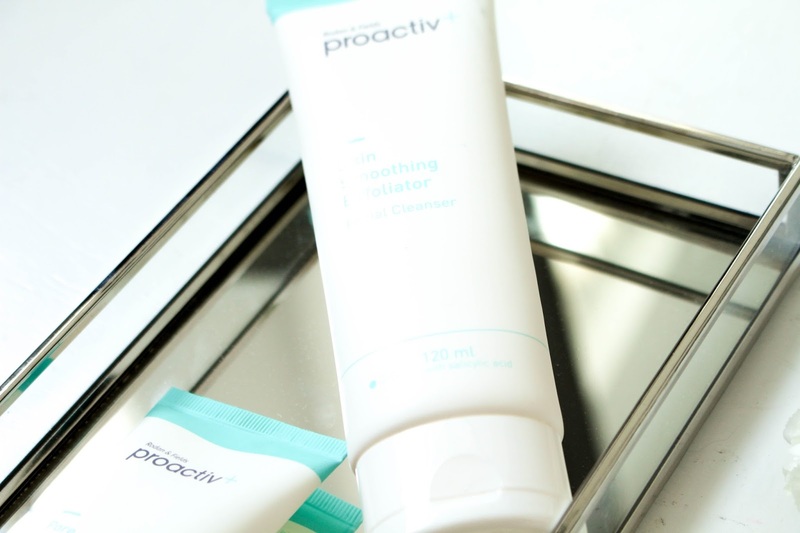 The ‘Complexion Perfecting Hydrator’ (step 3) is a nice way to finish of the skin care and is a nice thick moisturiser to help with dry patches. All the products have salicylic acid in which is great for bad skin but I have a feeling this is what has been giving me dry patches. Now the bad sides of this product is that you have to only use these three products, I really like using my toner and heavy night oils which after finishing the 60 day trial I think I will go back to using. I love the moisturiser but it isn’t a moisturiser that I feel I can slather on and it enrich my skin with moister, I just like something thicker. Now the only other down side I have really found about this product is that when I have used it and applied both the creams my skin has this feeling like there is a layer on top of it, which when blending foundation into it, it kind of bunches and rolls up which is 100% not what you want. So after doing the whole 2 month treatment I decided that I will keep using the products because they have helped with oil and my acne in general but I will only use the moisturises of a nighttime and then continue to use the face wash twice a day. Over all I would recommend this to someone who is suffering with acne because it has really helped my skin, like yes I still have really bad skin but it is so much better from what it was 7 weeks ago. But of course I say try it if you can stick to the regime or if you’re at a desperate place trying to reduce your acne/skin problems.